Devil May Cry 5 is rated 4.7 out of 5 by 1515. The Devil May Cry series began with Dante, a lone demon hunter. Today, he's not so lonely; other playable characters have rotated in over the years, including Vergil, Nero, Trish, and Lady. Devil May Cry 5 expands the cast again with V, a mysterious man who uses demonic companions to fight. 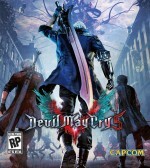 V offers a unique approach to DMC's stylish battles compared to the slash-and-shoot mechanics of Dante and Nero, but his addition comes at a cost: Bouncing among three characters provides fun variety, but it keeps you wading in the shallows of combat too long, rather than letting you dive into its impressive depths. The core appeal of Devil May Cry is stringing moves together to form your own elaborate and spectacular combos. Devil May Cry 5 generally delivers a precise and satisfying (if familiar) version of that formula. You launch underworld abominations into the air, slice them up, and blast them from afar, all using responsive controls that make it easy to cut through the horde. The story is ridiculous and barely coherent, but it works thanks to a few awesome moments I can't spoil here. All this serves as a consistently entertaining foundation, and all three playable heroes add their own variations. You start playing as Nero, who still uses his sword, gun, and grab to combine mobility and lethality. The biggest change from previous entries comes from his robotic arms. Each arm gives you different powers, like firing off a metal fist to pummel an enemy, super-charging your attacks, or giving you an extra mid-air dash. In theory, this system expands your arsenal with lots of new tricks. In practice, it isn't fun to manage. Several arms have contextual utility, but you can't switch among them manually; you have to break (i.e. waste) your limited supply until you get to the one you want. Plus, the arms cost orbs to replenish - the same currency you use to buy your moves and health upgrades - so spending resources on them feels like throwing your money away. Ultimately, they are fun to experiment with, but they aren't powerful or interesting enough to warrant the hassle and expense.